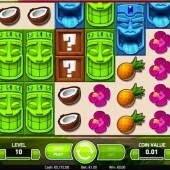 The tranquil settings of a far flung Pacific Island are what gaming slot developer NetEnt have dreamt up in Aloha! Cluster Pays. The 6 reel slot offers something very different from the many 5 reel games in their catalogue. For a start there are no paylines to speak of, all pays are awarded when symbols are clustered together in any position on the reels. Although this concept is not completely unique, it is something a little more out of the box form NetEnt. Something they arguably were in need of after a flurry of low volatility, branded slots. According to the Pays table, a winning cluster is formed when 9 or more matching symbols are clustered horizontally or vertically adjacent to each other. Added to this are the stacked mystery boxes, which if located next to a winning cluster will turn into the highest possible winning combination in a cluster. When a cluster is formed there may be a randomly activated Sticky Win re-spins. Those of you that may be fans of NetEnt’s Jackhammer slot will know how this works. The reels will re-spin automatically, but your cluster will be held. Matching symbols to your cluster that appear on further spins may be held if attached to the cluster. The feature stops when no further symbols have appeared on a spin. This feature is kind of exciting, although it does have a habit of not really delivering much in the way of big wins. Aloha! Cluster Pays has a pretty interesting free spins bonus feature. Land 3, 4, 5 or 6 free spins symbols during a spin and you will be rewarded with 9, 10, 11 or 12 free spins respectively. During the free spins many of the fruit symbols will drop off the reels, leaving only the higher paying symbols, such as the stacked totems. This can lead to some really big pays, as long as the other symbols drop out before the free spins have concluded. It is worth noting that as the symbols drop out, there are fewer symbols on the reels. This can lead to a higher chance of the free spins re-triggering. However, you will only get between 1 and 4 extra free spins, rather than the initial award. If on your final spin you don’t win anything, the big totem to the right of the reels may grant you an extra spin until you win. Aloha! Cluster Pays is one of those slots that’s going to have no appeal to some slots players, but then others will absolutely love it. The more I played it the more I enjoyed it, as I discovered new clever little parts of the game. With the flames around the re-spins, it does have a feel of a Hot Hot penny respin slot like the WMS slot King of Africa. However, to credit NetEnt they are very different games. 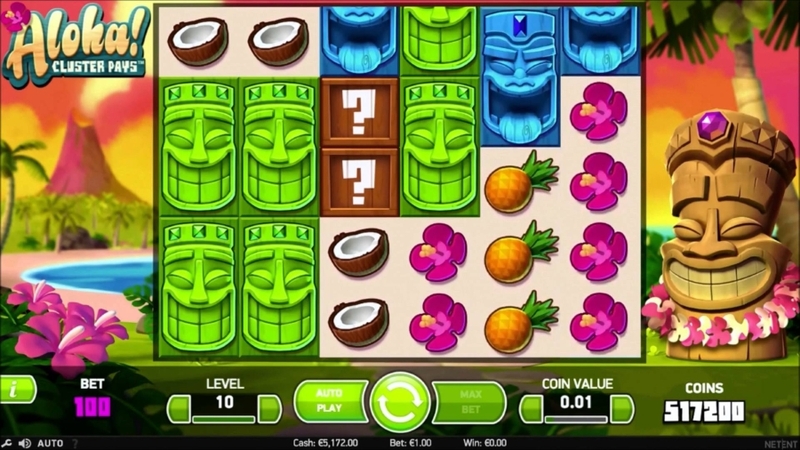 If you like the theme of this slot then you should also check out Aristocrat’s Tiki Torch or NetEnt’s very own Tiki Wonders.